This Situation Update describes events occurring in Bilin Township, Thaton District, during the period between July and September 2016, including civilians’ livelihoods, drugs and military activities. Civilians in Bilin Township faced significant problems with their paddy. Therefore, they are concerned about potential food shortages in the coming year. A villager from Ii--- village killed a monk and a monk servant, when he was under the influence of yaba (methamphetamine). The Bilin Township KNU police arrested him and held him in stocks, but he has now been transferred to the Bilin District Police Office. On August 23rd 2016, Tatmadaw Infantry Battalion #8, which is controlled by Battalion Commander Chit Min Thain, burnt down Jj--- village monastery after one soldier played with a lighter near an oil tank. The Tatmadaw Operation Commander, Lwin Kyaw, agreed to rebuild the monastery in a meeting with the villagers and monks. The following Situation Update was received by KHRG in November 2016. It was written by a community member in Thaton District who has been trained by KHRG to monitor human rights conditions. It is presented below translated exactly as originally written, save for minor edits for clarity and security. This report was received along with other information from Thaton District, including one incident report, two interviews, 32 photographs and two video clips. This Situation Update describes events that happened in Bilin Township, during the period between July 1st 2016 and September 30th 2016, including livelihood issues, drug issues and Tatmadaw activities. 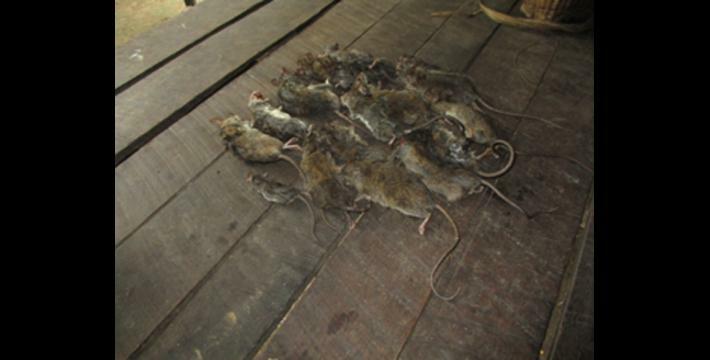 Civilians in Aee Soo Khee village tract and Htee Maw Khee village tract, Bilin Township, faced an extreme mice attack on their paddy [during the 2016 growing season]. The civilians in Aee Soo Khee village tract and Htee Maw Khee village tract mainly do cultivated hill farming for their livelihood and they live in rural mountain villages. Since the beginning of 2016 a lot of bamboo has been producing fruit, so there have been a lot of mice coming [to eat it]. Therefore, after the villagers planted the paddy in the rainy season, the mice ate all the paddy seeds and young paddy plants. There are a lot of hill farms that the owners could not harvest [after the mice destroyed the paddy] and they gave up on [trying to harvest] them. As I [KHRG researcher] went to Aee Soo Khee village and Wah Tho Pwah village, Aee Soo Khee village tract, I saw that almost all of the villagers’ hill farms had been absolutely destroyed [by mice], so they could not work [harvest] on their farms anymore. There are 34 hill farms in Aee Soo Khee village and 20 hill farms in Wah Tho Pwah village. 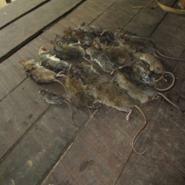 The mice also attacked the villagers’ paddy on the plain farms, where there is no water. The [plain farm owners] worry [that the mice will attack their paddy] because there has been less rain and the water on the farm has decreased, as well, the paddy has been producing fruit [new seeds]. Villagers in Toe Theh Khee village, Klaw Hta village and Kwee Lay Poo village, in Htee Maw Khee village tract, also face the same problem. 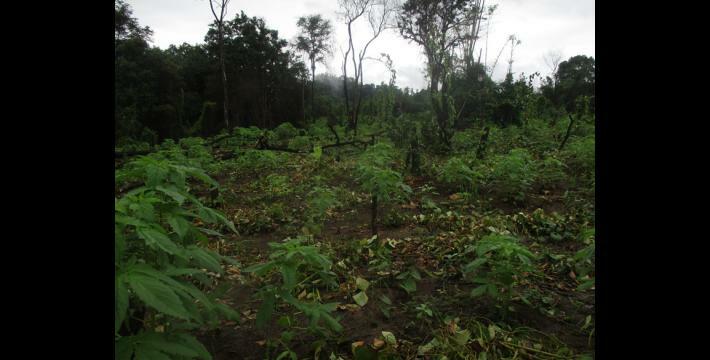 Regarding this problem, villagers reported that they will face an extreme food shortage in the coming year. When I went to those places, I found that villagers are unable to find another job, so they will be unable to solve the problem [food shortage] because they do not have money. Therefore, this is the biggest challenge or problem for them. In the years [before the 2012 preliminary ceasefire agreement], the drug b[yaba] was not well known by civilians in Bilin Township. After the preliminary ceasefire agreement, there was a lot of yaba [pills] coming into every area [in Bilin Township], because without [police] checks the unofficial cow and buffalo trade, as well as travelling by motorcycle and cars, got easier. In the past we heard that yaba was traded by unofficial cow or buffalo traders, who were passing through to other areas, but now we see that it is sold by local people too. We know that yaba is in K’Ma Moe Town in Brigade #5 [Hpapun], Ll--- village and Mm--- village [BGF controlled areas], but we have not seen the [yaba trade] in the open. Also, the Karen National Union (KNU) cannot investigate the yaba trade and cannot report this issue openly [to the local authority]. On July 9th 2016, Saw Hpah Aw Thee from Ii--- village, Meh Naw Ther village tract, Bilin Township, brutally killed one monk and one monk servant, who lived on Kk--- hill area, Ii--- village, without any reason. That is why we [I] can say yaba is coming into our area more. After he killed the monk and the monk servant, he decapitated them and took their heads inside a pagoda temple. Afterwards he went back to his house. After the [Bilin] Township KNU police officers got the case and arrested the villager, they investigated and interrogated him [about this killing case] but they could not find any [evidence] issue. He just said, “I did not know myself when I was coming [here] and killing”. The police took him to the [Bilin] Township Police Office and put him in stocks during the night, but they released him in the day. One day he punched a police officer and also bit a police officer’s nose. Regarding these incidents, we found out that [the Bilin Township] judges could not hold this [case], so they sent him to the [Bilin] District Police Office. This perpetrator had migrated to Thailand for a job in the past and he had used yaba there. He returned [to his village] just over one year ago. Therefore, we found out that [people who] are using yaba are doing things like this. There are [four] Tatmadaw army camps in Bilin Township, they are Yo Klah Tatmadaw army camp, Lay Kay Tatmadaw army camp, Ta Paw Tatmadaw army camp and Meh Pray Khee Tatmadaw army camp. These Tatmadaw army camps changed to [be patrolled by] the Border Guard Force (BGF) in 2015. Yo Klah Tatmadaw army camp is patrolled by [BGF] Battalion #1014, which is controlled by Battalion Commander Soe Myint. Lay Kay Tatmadaw army camp is also patrolled by Battalion #1014, but [controlled by an] unknown commander. Ta Paw Tatmadaw army camp is patrolled by Battalion #1013. Meh Pray Khee Tatmadaw army camp is patrolled by Battalion #1012, which is controlled by Battalion Commander Hennery. In each army camp two to three Tatmadaw soldiers stay with the BGF, but the Tatmadaw army column patrols around and stays in the villages. In 2016, we saw that they [Tatmadaw army] operated more and they were going around as they liked [without the permission of the KNU or villagers]. On August 23rd 2016, Tatmadaw army Infantry Battalion #8, which is controlled by Battalion Commander Chit Min Thain, patrolled [in the Bilin Township area] and stayed at Jj--- village monastery. While they were watching movies [by generator] the [engine] oil was used up, so [unknown] people filled the oil and some of the oil flew down onto the ground. One [unnamed] Tatmadaw soldier started a fire with a lighter, which spread directly to a big barrel of oil, and then the fire spread directly to the monastery. The bullets [in the monastery] exploded in the fire and the whole monastery caught on fire. The monks were not able to stop the fire, or take any materials or belongings from the monastery. Regarding the Tatmadaw's [motives for] burning down the monastery, some villagers thought that after they [Tatmadaw] stole [gold from the] pagoda, then they wanted to burn down the monastery [to hide the evidence]. Furthermore, villagers commented [with suspicion] that the Tatmadaw burnt down the monastery so they would be able to construct a vehicle road, because Brigade #5 [Hpapun leaders] had not allowed their 2017 vehicle road construction project between Lay Kay and K’Ter Tee village in Brigade #5 [Hpapun]. Regarding the activities of the Tatmadaw, these have been increasing and they have not been following the Nationwide Ceasefire Agreement, so civilians are worried that the fighting will happen again. Villagers and senior monks, who live close to this area, had a meeting about the fire at the monastery and they reported [uploaded] it to the internet [social media]. After that, [Tatmadaw] Operation Commander (G3), Lwin Kyaw, had a meeting with villagers and monks on August 25th 2016, where [he] promised to build a new monastery for them. The incidents and information that I have reported on in this report are all true, because I went and saw these happen, and I collected the information myself. 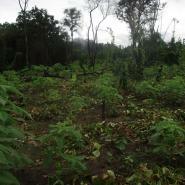 Some villagers reported [to me] that some non-governmental organisations came and worked into their community. They cooperated with armed groups, like the Karen National Liberation Army and the Burma/Myanmar government, but they did not accurately explain these [projects] to the villagers. Furthermore, the BGF stays in our area more [Bilin Township]; therefore, the yaba [issue] is increasing in our area [because they brought yaba into our area]. On January 12th 2012, a preliminary ceasefire agreement was signed between the KNU and Burma/Myanmar government in Hpa-an. Negotiations for a longer-term peace plan are still under way. For updates on the peace process, see the KNU Stakeholder webpage on the Myanmar Peace Monitor website. For KHRG's analysis of changes in human rights conditions since the ceasefire, see Truce or Transition? Trends in human rights abuse and local response since the 2012 ceasefire, KHRG, May 2014. In March 2015, the seventh round of the negotiations for a national ceasefire between the Burma/Myanmar government and various ethnic armed actors began in Yangon, see “Seventh Round of Nationwide Ceasefire Negotiations,” Karen National Union Headquarters, March 18th 2015. Following the negotiations, the KNU held a central standing committee emergency, see “KNU: Emergency Meeting Called To Discuss Nationwide Ceasefire Agreement And Ethnic Leaders’ Summit,” Karen News, April 22nd2015. KHRG has received multiple reports detailing abuses involving BGF Battalion #1013 and #1014, including: “BGF Battalion #1014 demands forced labour, asserts heavily militarised presence in villages in Hpapun District, June 2015,” KHRG, December 2015; Hpapun Incident Report: Villager killed by Border Guard Force (BGF) Battalion #1013 in Bu Tho Township, March 2015,” KHRG, September 2015; “Human rights violations by Border Guard Force (BGF) Battalion #1014 in Bu Tho Township, Hpapun District, May 2012 to March 2014,” KHRG, July 2015; “BGF Battalion #1014 forced labour and forced recruitment, April to May 2012,” KHRG, June 2013. Further reports detailing abuses involving these battalions are also available on the KHRG website.